The Fowles Wine vineyards and winery are located in the bucolic, windswept, super cool-climate Strathbogie Ranges of Central Victoria, Australia at an elevation of over 1600 feet. The soil there is nutrient poor and extremely well drained, comprised of a granitic base rock mixed with sand, quartz, and ironstone gravel, making it exceptional for viticulture, but little else. Fanatically committed to ethical and sustainable viticultural practices, as well as hunting and living off the 800 acre expanse they occupy in this remote region, Matt Fowles launched the Farm to Table range of wines to help promote this deep connection to the land. All of the wines are sourced from Fowles estate vineyards in the Strathbogie Ranges and express clean and vibrant varietal character. The “minimal intervention” approach to winemaking they employ, coupled with the cool climate terroir of the Strathbogie Ranges, result in wines that are subtle and refreshing on the palate. Fowles Wine is the only winery in the Strathbogie Ranges currently awarded the distinction of a five star rating from James Halliday. Matt Fowles, a former lawyer who swapped the vitriol for the vineyard, is an avid food and wine man. While his chief responsibility is the business of wine, he spends much of his time feeding his connection to the Strathbogie Ranges. Whether that is time in the vineyard, playing with wine or hunting for his table – he truly understands this land. 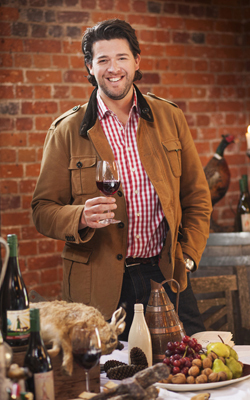 In 2007, Matt was selected as part of the ‘Future Leaders’ program aimed at fostering the next generation of wine industry leaders. The program is run by peak industry bodies; the Winemakers’ Federation of Australia and Wine Australia. Matt now sits with the Winemakers’ Federation of Australia.